how adorable is this collection of BabyLit board books by jennifer adams & alison oliver? 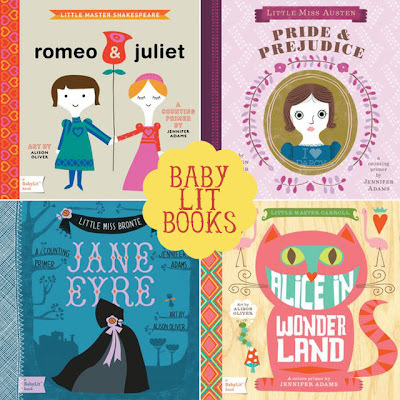 turning a literary classic into a tale for your toddler using beautiful illustrations. they're going to look adorable on my girls' book ledges in their new room! check out these fantastic organizational ideas for your office using tension rods, labels, baskets, and folders. i'm on a quest to find super short tension rods so i can reorganize my billy bookcases in my office, amongst other nooks and crannies in our home. i'm stocking up on activities for my 4 year old in preparation for baby's arrival. i ordered H this fingerprint drawing book by ed emberley and picked up a washable melissa and doug stamp pad set from indigo. the designs are simple and oh so cute. she is going to have a blast with this book! i'm looking forward to transforming my wardrobe this Spring after baby arrives. after little h, i didn't get much of a chance to get into a groove... i became pregnant again when she was just shy of 7 months. i am loving... these shoes, this jacket, this cardi and this dress! as many moms can relate, i've lost much of my fashion sense since having kids and one of my resolutions to myself is to gain it back! valentine's day is around the corner and here are some craft ideas for that sweet girl or special boy in your life. I have also fallen in love with those books. I couldn't resist buying the jane eyre one even though afton is too old for them. love the cute valentines ideas! i lost all my fashion sense after babies - and then some...but until I get the baby weight off I can't really do too much about it...I am in fashion limbo for a while! my son is addicted to the ipad...it gives me tons of free time...he traces ABCs, and does puzzles, and puts together trains and 'reads' sesame street books...it's a godsend with little baby brother to look after. Haha, you're kidding, I have a post in my drafts right now about those babylit books! I bought some before Alice was born and love them!